Winner of the 2003 American Society of Journalists and Authors' June Roth Memorial Award for Health and Medical Books. An authoritative book with new lifesaving strategies for those at risk and those already diagnosed. Lung cancer kills more women than breast cancer, more men than prostate cancer—because it's usually found too late. Claudia Henschke's groundbreaking research on early diagnosis, published in The Lancet, made headlines worldwide. Now, for the first time, she offers specific recommendations based on her latest findings: who needs to be checked, where to be tested, and what to expect. Dr. Henschke and coauthor Peggy McCarthy, a leading patient advocate, provide up-to-the-minute information on diagnosis, treatment, and survival, accompanied by inspiring words from survivors. This book is helpful for the cancer patient along with any one who loves someone with cancer. 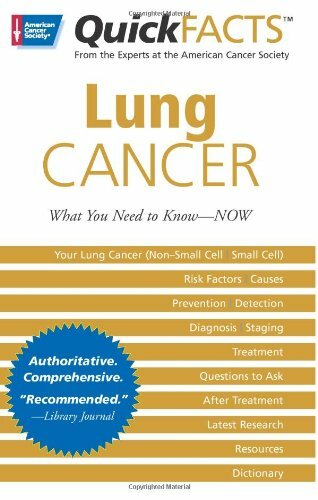 When my mom was diagnosed with Lung Cancer, I didn't know enough about it.I purchased several books on lung cancer but found this one easy to read, direct and to the point. 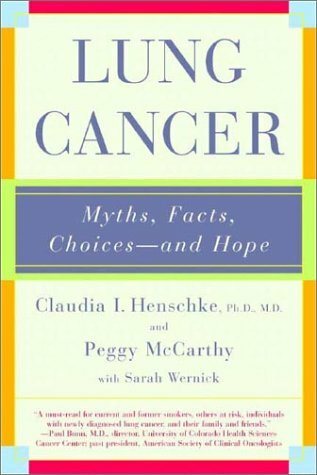 This book helped me understand when the Oncologist talked about the stage of mom's cancer and the options available.Not only did this book give me a clearer overall picture of lung cancer, it is an awesome resourcetool and assisted me in the proper questions to ask the doctor.I recommend this book to anyone who has just been diagnosed or has family or a friend who has. 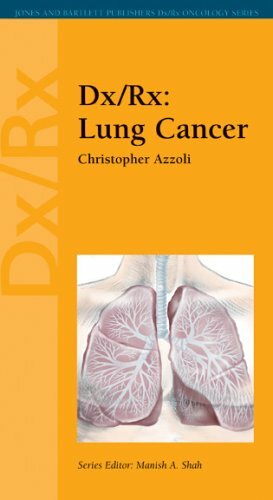 This book champions the use of lung scans, for those at high risk of developing lung cancer, BEFORE symptoms appear - scans that radically and dramatically increase the odds of surviving this dreaded disease. While fully aware of the chance for false positives and their consequences, Henschke provides compelling reasons for utilizing this technology anyway. 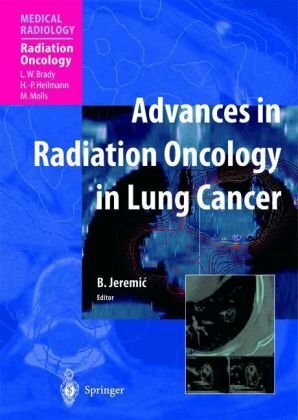 The book also consists of a thorough review of such topics as lung health, lung cancer and its development, treatment and diagnostic options in addition to lung scans, recovery tips, and alternative methodologies. This is a terrific reference source for people such as former smokers who are doing what they can to avoid developing lung cancer and who also want to maximize their odds for BEATING lung cancer should they develop it anyway. All about lung cancer for the layperson. This book is a must-read for current and former smokers. About 25% of adult Americans still smoke even after years of learning that it is a very deadly habit. This is because the nicotine in tabacco is highly addictive. Sadly over 80% of lung cancer is caused by smoking. The human body is just not designed to handle all of the dread toxins that smoking puts into the lungs and the rest of the body. This is one of the most deadly forms of human cancer. This book is a valuable resource explaining both the challenges and choices faced by a lung cancer sufferer and his/her family. Each year, more than 170,000 Americans develop lung cancer. Although cancer rates fell in 2008, lung cancer incidence and mortality increased in 18 states, in part because the disease has no accepted screening test to aid in early detection. Cleveland Clinic is the number-one cancer hospital in Ohio and is consistently ranked among the top four hospitals by USNews & World Report. 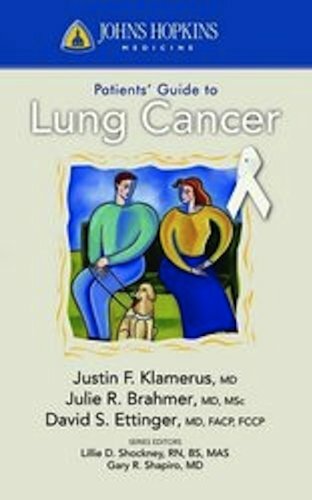 Provided by the patients, their friends, families, and caregivers of those diagnaosed with lung cancer, these very personal stories offer inspired insight into the ways families and professionals care for both themselves and the patient, gain a deeper understanding of the relationships, and learn to come to terms with the end of life. Included are essays by medical experts about the science of lung cancer, current treatments, choosing the right doctors, and what the future holds for the next generation of patients. 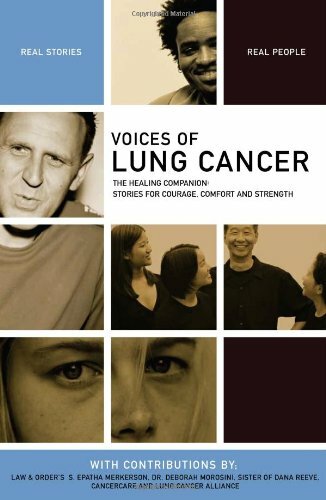 My Dad was recently diagnosed with lung cancer.I ordered this book along with a more clinical book on lung cancer.The, "Voices of Lung Cancer" book provided great insight into many individuals' learning of their diagnosis and prognosis, how they received the news, and how they chose to fight cancer.It is very inspirational and it gave me a great deal of hope because it talks about people who chose to fight cancer vs. settle for their prognosis.The book is written from the point of view of the cancer survivor as well as caregivers and friends.A few chapters in the end talk about people who didn't win the fight.I learned so much from reading this book and I highly recommend it. Real people telling real stories of their lung cancer experience.True stories of survival and hope.Very good read and very informative. 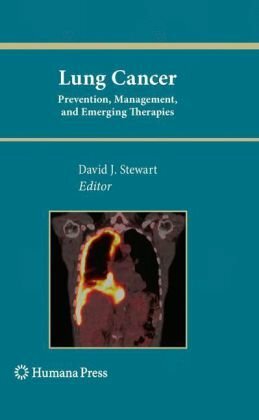 More than 1.3 million people worldwide will be diagnosed with lung cancer this year, and this book emphasizes that all patients should be well-informed decision-makers in planning their own treatment. Covering everything from risk factors to living well after cancer treatment, this pocket-sized reference provides critical questions to ask your healthcare team, is updated with the latest patient treatment guidelines, and includes an advanced dictionary of cancer-related terms. I found this book to be a treasure of information. A sad ending for us personally, but the book was well worth reading. On December 26, 2005, with his adult children and grandchildren still gathered in for the holiday, Walter Wangerin Jr. discovered a lump in his neck that proved to be a malignant tumor, metastasized from his lung. Three weeks later, he wrote the first of 22 letters --- updating friends on his prognoses and treatments, his physical and spiritual health, and his reflections on life in the shadow of death --- most of them sent out over 18 months. (A few are marked as being "never sent.") These are missives a younger writer might have posted on a blog site. I infer that he wrote them on a typewriter, engaging an assistant to format them for an email outbox. Halfway through the collection, he mentions the possibility of publication. (In the second half, his writing seems a little less intimate, as if he's consciously aware of his potential readership.) Indeed, the letters are presented here for a wider audience, interspersed with short meditations --- six by his own hand, a seventh by poet Robert Siegel. In the prologue he explains, "I'll tell my story step-by-step from within the ongoing experience. I needn't draw from memory." Especially in the first half, that immediacy is evident. What will the doctor say tomorrow? How will he respond to this pain --- or this pain killer? "I contain pain," he writes. And "I am sincerely grateful that my adventure waited until there were therapies and drugs to serve this sort of thing [pain]" --- though it seems much of the pain is caused by curative therapies. How does this disease change his relationship with his wife, his grandchildren, and his garden? The book works because Wangerin is such a good writer. He draws us into his private life, not as voyeurs but as fellow travelers. Some of Wangerin's more interesting comments have to do with the language we use about cancer: we battle against it. "Cancer really isn't an issue of defeat or victory. We are all going to die." He goes on to talk of blessings received as a result of his cancer. "Surely it's high Time --- isn't it? --- that we pay as much attention to the blessings of a long affliction as we do to the pain for which we curse it." He also interestingly works with words, turning slowth --- some combination of slow and growth --- into a noun that describes benefits of facing daily life at a reduced pace, not by choice but by forced circumstance. Would I recommend this to a person of faith who has metastasized cancer? Yes, if that person has a solid familial network, for that is where Wangerin gains much of his focus and strength. The book ends with a two-line postscript, in which Wangerin states that his health was "stable" in April 2008. That's nearly 20 months before publication in early 2010. Though strangers to him, readers invited into his life would have welcomed a well-deserved, press-time update. I'm not a religious sort, and I'm generally not a fan of poetry, so whether on the spiritual or literary planes, any Biblical verses Mr. Wangerin cited were pretty lost on me. However, they could be precisely what another reader might like best. I found that I skipped the meditations and focused on the letters. The letter on pain ("I contain pain.") is the most memorable. Other standouts: how some of his human frailties (i.e., flashes of anger) emerged at different times; his description of trying to get air; his sense of Time and paying attention; and his close examination of his grandchildren's hands. The ending disconcerted me; its abruptness contrasted sharply with the careful thoughtfulness of all that preceded it. For such a small book, it is meaty, and I recommend it. This is a painfully beautiful book. Walter Wangerin Jr. is a children's author. However, he's also a Bible scholar and a university professor of writing. This particular book exposes his personal thoughts and experiences in a memoir. The title should give it away, Letters from the Land of Cancer. Letters is a collection of actual letters Wangarin wrote to family and friends after he was diagnosed with cancer and while he endured treatments. They are honest and revealing, but poetic and beautiful. Sad, but triumphant. The letters intertwine his expertise as a Bible scholar, his resolute faith in Christ, his stark transparency as a patient and his exquisite use of language. If you enjoy peering into people's souls you'll love this book. If you long to empathize with someone you know personally who suffers from cancer or any other life-threatening illness, you'll cherish this book. If you enjoy poetic language for its own beauty, Letters will nourish your soul. This book is not just for cancer patients. It can apply to anyone suffering an illness, whether terminal or not. The author shares his pain, his sorrow, and his faith in God for his condition.The book opened my mind up to the possibly of death and how we can face it, knowing that God is in control and with the right attitude, we can and will survive and overcome the fear of death.Heaven is our final journey and with that will come complete healing and joy. 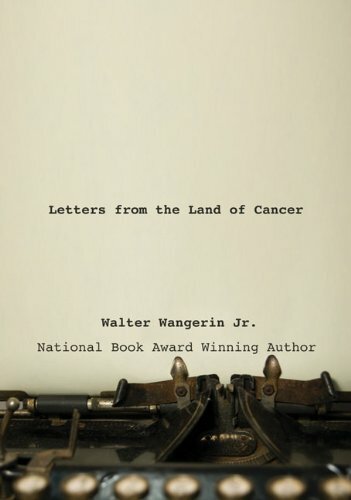 In this powerful collection of letters and meditations, award winning author Wangerin writes with raw honesty and challenges all of us to think about our own mortality, and possibly rethink our view of cancer. He starts by calling his 2 year long bout with lung cancer a "dance" and later on, an "adventure." He refuses to call it a "battle." The reader finds out about half way through the book that although Wangerin can't bring himself to pray for his own healing, he is certain .."healing is surely to come;either healing of his body or his own weary spirit." The book is really all about facing our own mortality, which Wangerin says .."brings out the child in us,the heart filled with childlike longings and an infant's perfect trust." All of the letters, written mostly to family members and friends, are beautifully put together with the grace and eloquence associated with Wangerin. #9 and #19 are two of the best. In maybe the most poignant of all the letters, you get a sense of Phil 1:23 as the author writes to a former student: .."I don't pray for death. But I wouldn't mind an early visitation.There is just so much about this world and its leaders which is so disappointing it crushes my heart.."
The beauty of the book is perhaps summed up best by the last sentence of letter #15:.."It is a good day.Gladness is available. Christ is at hand." This is a must read for all, for we all have to face what Wangerin so honestly, beautifully and courageously faces head on... our own mortality. A light in the darkest moment of my life. I ordered this book shortly after being diagnosed with lung cancer.It is so helpful, hopeful and positive.The author has lived through a very scary and advanced stage of lung cancer and has given this book to people like me as a guide through this disease.The writing is very straight forward, the content is very inspirational and useful and the book is really concise. The medical books I have read since reading this have backed up everything I read in this book.I highly recommend this book as a powerful and bright beginning of anyone battle with lung cancer. 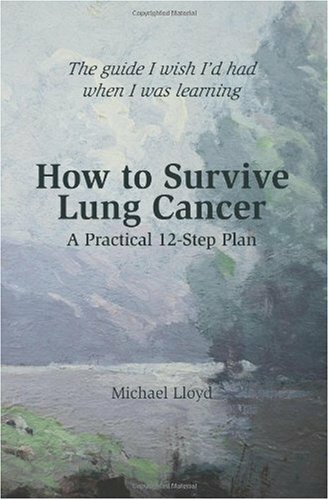 A family member was recently diagnosed with lung cancer and this book has been a Godsend.It is easy to read, concise and positive.I have bought numerous books about lung cancer, but this one is easily the most versatile and informative. Excellent guide that gives hope ! 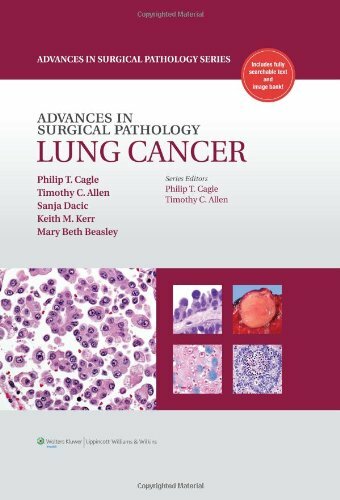 Advances in Surgical Pathology: Lung Cancer, a volume in the Advances in Surgical Pathology series, features chapters on current and impending changes in the field of lung cancer that directly affect pathologists. This includes the 2004 updates of the WHO Classification of Tumors of the Lung; the ongoing new classification of neuroendocrine carcinomas of the lung by the International Association for the Study of Lung Cancer; the ongoing revision of the pathologic and clinical staging of lung cancer by the AJCC; molecular diagnostics in the diagnosis of lung cancer; the role of the pathologist in the new molecular targeted therapies for lung cancer; and the new use of image-guided, multimodality theranostics for the diagnosis and treatment of lung cancer. Other current topics discussed include new understanding of the premalignant and preinvasive lesions and the controversies and revisions of the diagnosis of bronchioloalveolar carcinoma. Dr Lange's book on surviving helps to organize all the confusion that the diagnosis of lung cancer brings.He offers hope by making sense of the next step and the next, and helping the patient understand the physical and emotional aspects of the diagnosis.As a family practitioner I have recommended his books more than once to my patients when they have had to face the challenging diagnosis of cancer. 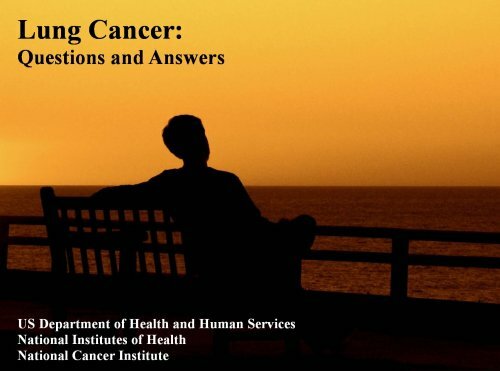 Once again, Vladimir Lange takes the hand of those of us whom cancer has seen fit to visit and leads us on a journey of extremely applicable, helpful information. A cancer survivor myself, I was so very glad to have Dr. Lange's book on breast cancer during my treatment, as it not onlyprovided ideas for innovative pro-active measure to take, but also gave me a peace of mind that I had not yet found in my journey of dealing with this disease. 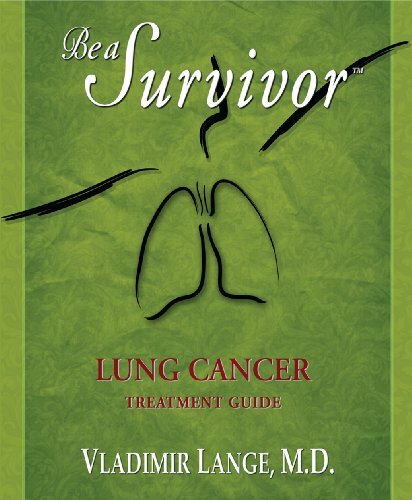 Having friends with lung cancer, I read "Be a Survivor -- Lung Cancer Treatment Guide" as well and found it to offer the same level of valuable counsel--only targeting lung cancer. I can confidently recommend this book to anyone dealing with such a diagnosis. 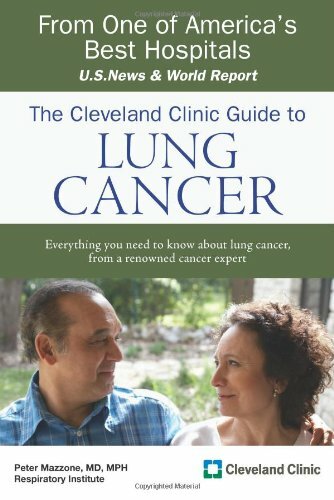 I was interviewed for this book as a lung cancer survivor.I sincerely feel that it is a honest and helpful resource for lung cancer patients... and long overdue.I wish I had had it when I was diagnosed 3 1/2 years ago. I love the personal comments from patients... and it gives hope for those with this very dreadful cancer. Lung cancer is the leading cause of cancer-related mortality. Metastatic lung cancer is responsible for more than ninety percent of lung cancer related deaths. However, relatively little progress has been made in understanding the process of lung cancer metastasis. 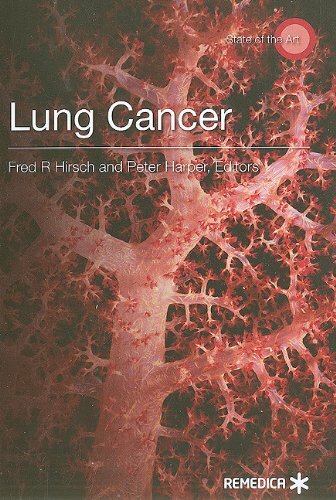 The two main aims of this book are a) to introduce clinical aspects to basic scientists and basic molecular and cellular concepts to clinical investigators, in order to promote collaboration and foster much needed translational research; and b) to introduce new and emerging concepts and approaches in metastasis research to lung cancer research community at large. 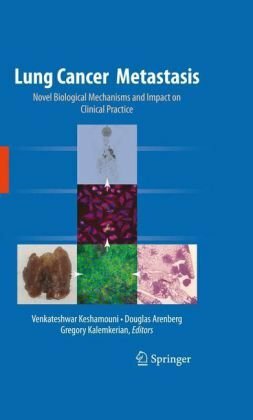 In this attempt, the book will cover a broad spectrum of subjects ranging from the current trends in the clinical management of the metastatic disease, to the systems biology approach for gaining insights into the mechanisms of metastasis. Some of the subjects covered will include: defining basic hallmarks of a metastatic cell, the concept of tumor stem cells, epithelial-mesenchymal transitions, evasion of immune-surveillance, tumor-stromal interactions, angiogenesis, molecular imaging and biomarker discovery. 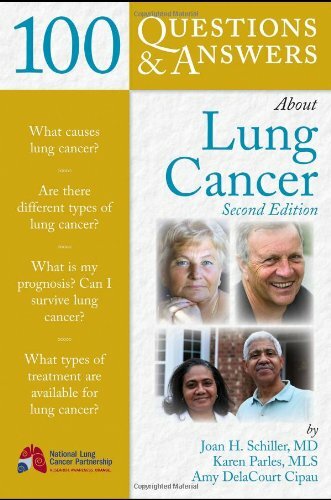 This Lung Cancer Book is for people seeking more information about Lung Cancer, Lung Cancer Treatments, Stages, Signs, and Causes.It is also for family members and others seeking to learn more information on Lung Cancer and gain a better understanding on how to help and support lung cancer patients. 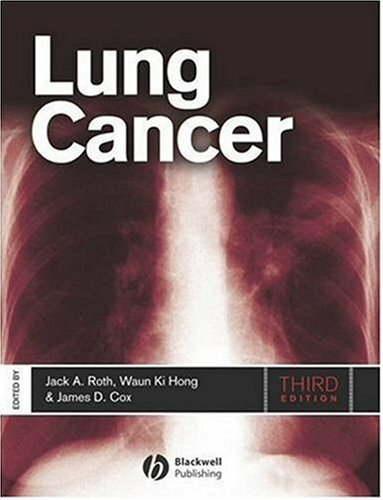 This Lung Cancer Book is concise, factual, and to the point. This National Cancer Institute (NCI) booklet is about lung cancer, cancer that begins in the lung. It tells about diagnosis, staging, treatment, and comfort care. Learning about the medical care for people with lung cancer can help you take an active part in making choices about your own care. This booklet has lists of questions that you may want to ask your doctor. Many people find it helpful to take a list of questions to a doctor visit. To help remember what your doctor says, you can take notes or ask whether you may use a tape recorder. You may also want to have a family member or friend with you when you talk with the doctor—to take part in the discussion, to take notes, or just to listen. 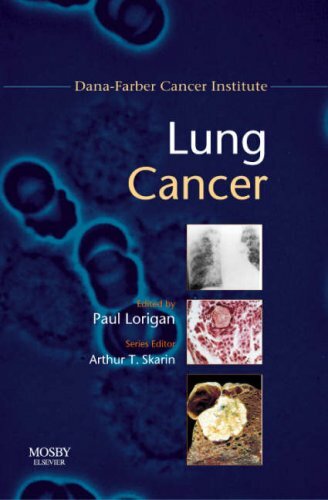 Written by highly eminent authors, Lung Cancer - a handbook in the Dana-Farber Cancer Institute series - is produced in full color and is richly illustrated throughout, providing a review of each cancer including its incidence, epidemiology, etiology and histopathology, together with the clinical features. Diagnostic studies and current clinical and pathological staging are also given. Detailed tables are provided with histopathological classification, diagnostic studies and, when important, prognostic factors. Current therapies are also discussed in detail, particularly the management of metastatic lung disease in the context of new and emerging treatments.